Bullion prices, as many other commodities prices, didn’t do much on a weekly scale. Perhaps many traders continue to anticipate for next week’s FOMC meeting that might stir up the markets, especially if there will be big headlines. In the mean time the precious metals market dwindled with little movement. During the week, there were several headlines from the IMF: it reported that the European banks’ financial problem is far from over and the banks may reduce their balance sheets by as much as $2.6 trillion. The IMF also projected the EU will contract in 2012 by 0.3% and expand by only 0.9% in 2013. On the other hand the IMF also announced its global growth outlook in 2012 to be 3.5% which is 0.2 percent points higher than its previous estimate. These headlines helped shift the direction of the financial markets on a daily basis. Finally, by the end of the week it was reported that the Philly Fed had grown by a slightly slower pace and the jobless claims weekly update wasn’t too positive. These news items pushed up bit gold and silver prices. By the end of the week, gold price slipped by 1.05% while silver price rose by 1.05%. Gold price moderately declined during last week by 1.05%; furthermore, during last week the average gold price reached $1,644 /t. 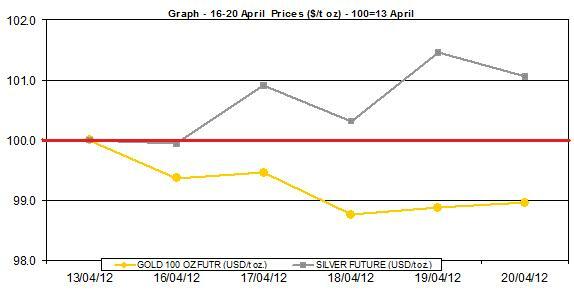 oz which is 0.98% below the previous week’s average price of $1,661 /t. oz. Gold price finished the week at $1,642.6 /t. oz. Silver price, unlike gold price, slightly rose on a weekly scale by 1.05%; on the other hand, this week’s average price reached $31.62/t oz which is 0.34% below the previous week’s average $31.73/t oz. During last week, the average daily percent change of gold price decreased by 0.21%; silver price edged up by an average daily rate of 0.21%. 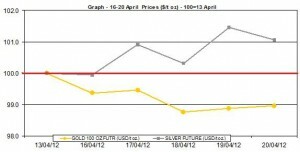 In the following chart are the changes of gold and silver prices, which were normalized to 100 to the end of the previous week – April 13th. 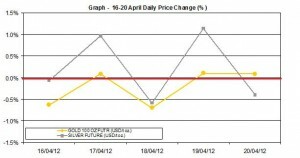 Gold price declined during most of the week, while silver edged up during the week. The second chart presents the daily percent movements of gold and silver (or in other words the shifts around the trend). Gold and silver prices zigzagged during the week from gains to losses; their movements were moderate with no big shifts; their daily percent changes ranged between nearly 1% gain and 1% loss.